My impromptu head massage by an elephant during a stock shoot was actually kind of creepy...and slimy! I am off to Thailand early tomorrow morning for twelve days of shooting stock. My partner Stephanie and I will be keeping our eyes open and cameras ready to capture whatever opportunities come up as well as undertaking a few planned shoots. We have arranged to photograph elephants, tigers and alligators (or are the crocs?). All in all it should be a fun and fruitful trip! As you can see from the elephant photo above (that’s me getting the head massage), I have shot elephants before in Thailand. 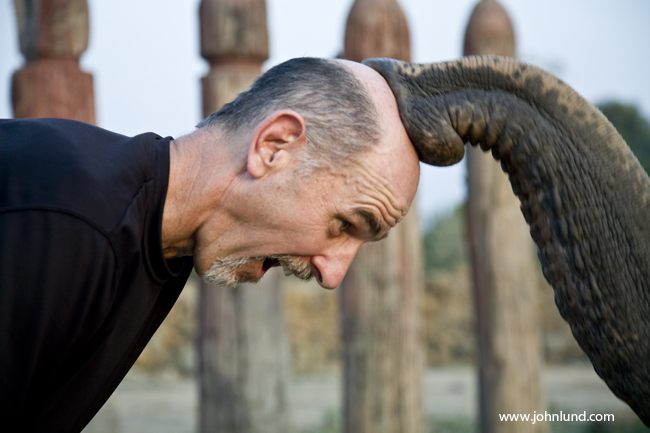 BTW, having an elephant’s trunk massage your baldhead is actually kind of creepy…and slimy! I had a great time shooting elephants before and have arranged to spend a day learning to be an elephant Mahout (trainer). I get to spend a whole day with my own elephant learning how to direct him or her, giving the elephant a bath, and then taking a jungle trek atop the great beast! All the while Stephanie and I will be keeping ready for photo opportunities for our stock collection and raw material archives. I did photograph a tiger here in the U.S. once, but this should still be fun and a great opportunity for some awesome “parts” from which to create my composite, conceptual stock photos. Of course, part of what makes for a successful stock photo trip, for me, is not getting too attached to your “expectations”. There are quite a few things that can go wrong...and if they do go wrong, and you don’t get what you thought you would, why wreck your trip over it? 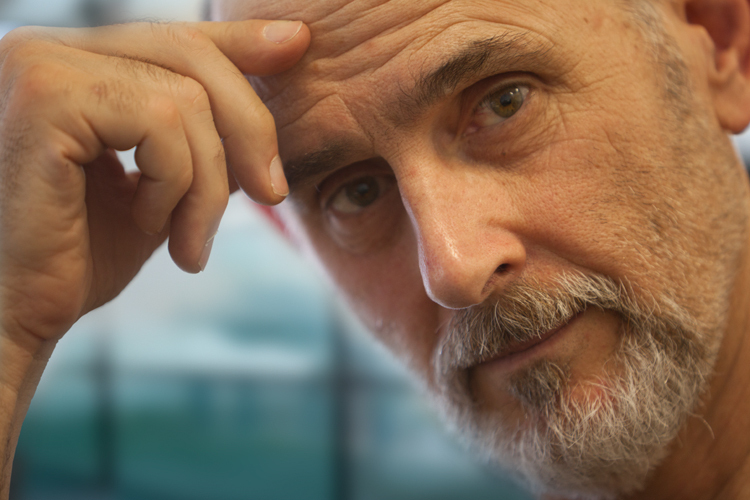 If you don’t get the shots, you don’t get the shots…but you don’t have to suffer over it. Very Buddhist of me…and heck, sometimes I actually manage to achieve such a great attitude. I’d rather just get the shots though…. I have had some great selling stock photos over the years that were grab shots on my travels, so I always try and stay as open as possible to those opportunities. 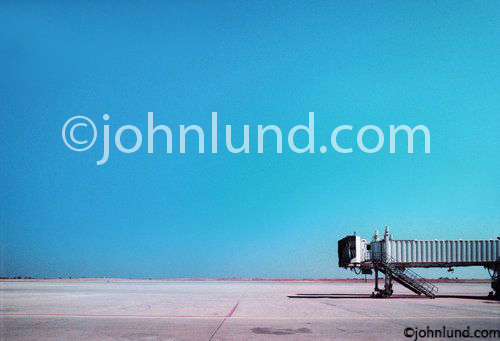 Once, on a trip to Burma, I pressed my camera up to the glass in a waiting area in the Mandalay Airport (or was it the Rangoon Airport…uh…I don’t remember) and, with a touch of Photoshop, ended up with a great picture of a gangway on the deserted tarmac. This shot paid for the entire trip and then some with its royalties, those sales have dried up recently as there are now a spate of such images. Hey, I think that may be the first time I have ever used the word “spate” before! In another case I was in a train station in Mumbai, raised my camera high above my head, and fired off a few shots at a fifteen of a second (to blur the crowd) before a machine-gun toting guard suggested I desist…which I promptly did. However, one of those grab shots has, at this point, paid for half of that trip! Cool! At any rate, I will try to use this photo blog to share some of my trip…but how much depends on Internet access (which should be good), and how much time I have (who knows) and, well, again, who knows! Worst-case scenario, there will be a lot more material to share when I return. Stay tuned! Have a great trip up in Thailand John! I'm sure gret images will be in your basket back home! Are you by chance going to Patara Elephant Farm near Chiang Mai? Great place and you'll have lots to work with for photos. Different place...we are going to Anantara. Supposed to be great thought! I love your concept with elephants. I love elephants, I am definitely a fan your photography lol plus I'm an up and coming photographer, I've used your photos for my tumblr. check out my blog: click on my archive, full of elephants.